This report will show automatically on the Reports screen. The Usage Report is shown based on the last month. 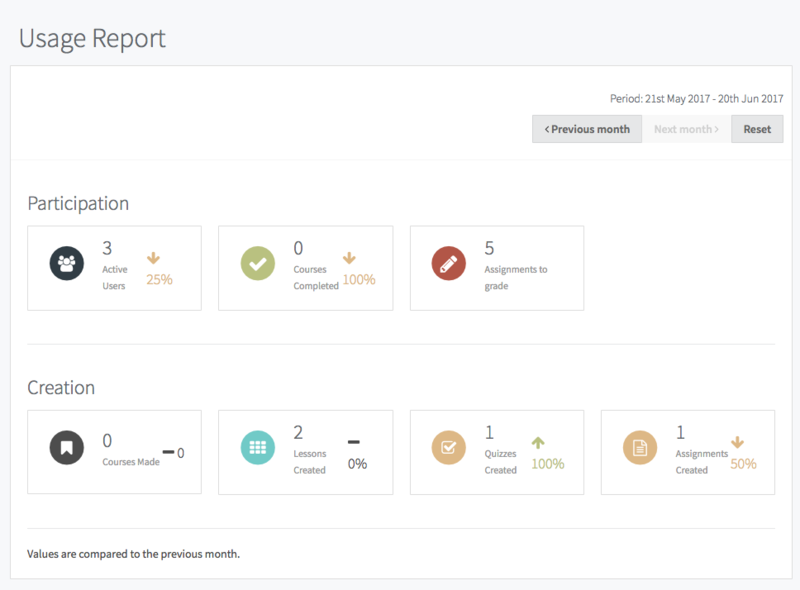 Under the Participation heading, you'll be able to see your Active Users, Courses Completed, and Assignments to Grade. The percentages next to these figures show changes from the previous month. Click on the Assignments to Grade button to be taken to the Assignment Grading screen. Under the Creation heading, you'll be able to see an at-a-glance overview of what e-Learning content you've made in the last month. This includes Courses, Lessons, Quizzes, and Assignments, and shows percentages compared to the previous month's output.